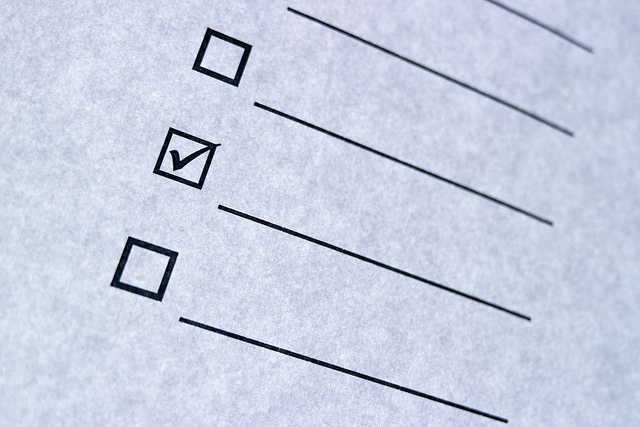 The best-laid plans of mice and men may go astray, but a checklist still helps. Photo by Daniel Kulinski, used under Creative Commons licensing. Conducting a restoration project can be an extremely complex process. Of course, the condition of the site has a lot to do with just how complex the project turns out to be, but the approach you decide to take in healing the land and the contributions of those requesting the project also directly affect its complexity. It never ceases to amaze me how something I thought would be a straightforward, simple project can turn out to be a nightmare. Not being in total control of a project brings its own set of problems, as I learned once when I was handed a site with no instruction beyond "make it happen." The site didn't look bad at first, but once we began conducting our site analysis we discovered a host of issues that just kept building upon each other. I tried to bail, but no dice: commitments had been made; there were promises to keep and requirements to deliver. First came a requirement to maintain an access road for utility maintenance—ok, we can just avoid planting in a strip. No, the response was: you have to maintain its elevations, not its slopes, since the road needs to carry big trucks. Oh, now I have a dike running lengthwise through the site. We continued on, but we did not follow a checklist for site analysis like the one we provide in our book. It turns out the site also possessed an underground telephone line crossing. Unfortunately, this was discovered during construction--I didn't realize how fast telephone cable workers could splice back together 200,000 wires! I didn't ask what it cost. Things are going along fine—or at least adequately—and spring is upon us when I get our monthly maintenance report. Our temporary irrigation system is costing us a fortune, what is going on? We discovered Little League season had begun and our sprinkler heads were at the ideal level for practicing that "home run swing." The only solution was to put up a fence and gate system, something I really do not like to do in a river plain. We discussed the issue with the officials of the Little League, changed the type of sprinkler heads, and we were on our way to resolving this money drain. At about this same time we began to notice that some trees over 20 feet tall were not producing leaves, creating a big brown area in a corner of the site. Upon inspecting the trees, we were stunned to notice that all the trees had been chopped and left standing by the tree stakes. We speculated that someone must have gotten a hatchet for Christmas and tried it out. After evaluating the number of trees and the location in the site we decided to leave the trees as they were. Dead standing trees provide a habitat not typically found on new restoration project. While not everything can be predicted, we certainly would have benefited from having an organized method of examining and recording information about the site for this site. The checklist my coauthors and I provide in our book is the result of many years of projects, our own and others’. It should cover most, if not all, contingencies, as we haven't had to add to it for some time. The checklist prompts you into thinking about the site from different perspectives, putting you ahead of the challenges you may face. We hope you find it helpful. John Rieger is a long-time practicing restoration ecologist, cofounder and first president of the Society for Ecological Restoration, and coauthor of Project Planning and Management for Ecological Restoration.